I’m currently in New Zealand spending Christmas with Westie and her parents. When abroad, if I can find a decent shirt maker and a good bar then I’m a happy traveller. I found Rixon Groove while ankling through the Bank Arcade. A three floor shopping area which was once, as the name suggests, an old bank. A beautiful building it now houses clothing boutiques, most of which are independent. The back story to Rixon Groove is available on their website. Putting them in context they’re a bit like a Kiwi version our own Nino Santoro. Founded by Simon Fulton who runs the shop, RG is a proper shirt maker supplying Made to Measure, limited edition off the peg and hand made ties. There are various things about this outfit that appealed. The range goes from traditional business shirt to flamboyant patterned fabrics and colours more suited to social occasions than business. But Simon certainly has a good eye for design, and softer collars definitely give his shirts a more relaxed antipodean air. Additionally, rather than being shipped of to the Far East, all the shirts are made in Wellington including the off the peg ones. The same standard applies to the ties too. Because they’re only a small outfit (the one shop) all garments are limited edition, when the cloth runs out, that’s it. The ties are made from fabrics sourced from all over the world, and each carries its own reference number telling you which one of the batch you’ve bought and how many remain –which is a nice touch. As to price, buying in dollars and paying in pounds provides excellent value. 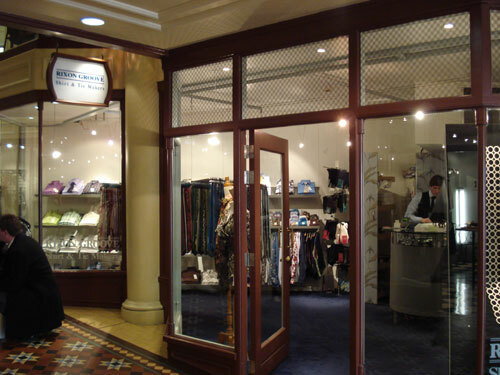 Made to Measure shirts (no minimum order) come in at $194 NZ, about £72 per shirt, and they deliver all over the world. 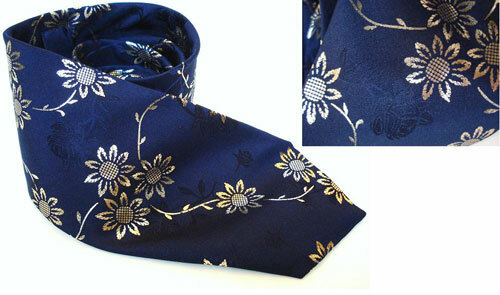 Meanwhile a limited edition handmade tie will set you back just $99NZ, which is just £37. I didn’t have time to get a shirt made but I couldn’t resist picking up one of their ties. A left field choice, even for me, it works wonderfully well with a blue suit and Bengal striped shirt. Oh, and my bar of choice in Wellington, Hummingbird. They serve a good cocktail and the decor is that of a 1940’s French brothel. Nice to see you putting some NZ stores out there. I’m from wellington and in Auckland studying. Where else in NZ are you planning to visit? Clothes wise, I normally pop into Rodd & Gunn. But we’ve been in Waihi all last week and we’re off to Coromandel today. I doubt I’ll find much else, but if you know of something I should check out please let me know. Loving your summer by the way.